And we know when. 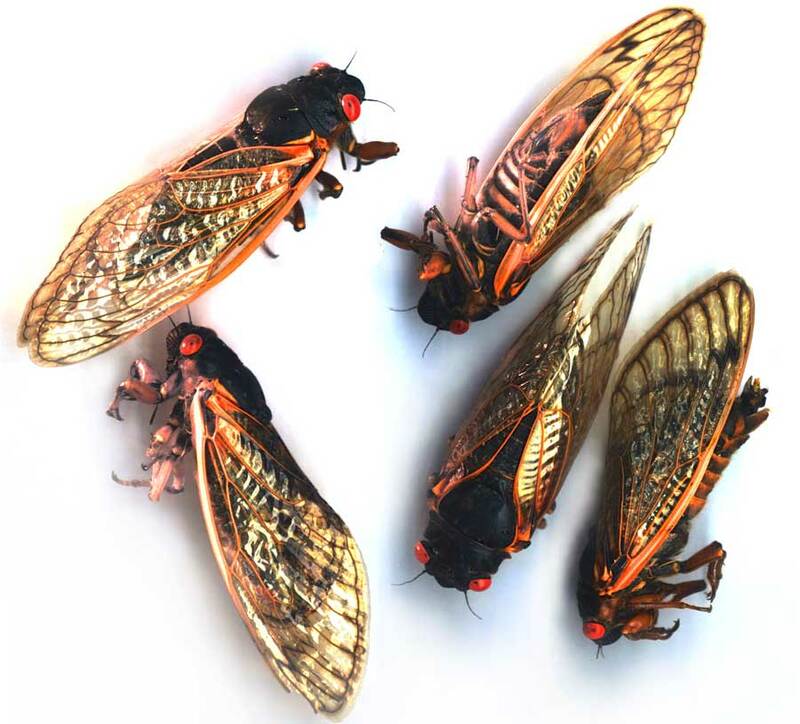 These 17-year cicadas of Brood X struggled out of their shells in 2004, and their millions of offspring are expected back to the Eastern U.S. in 2021. 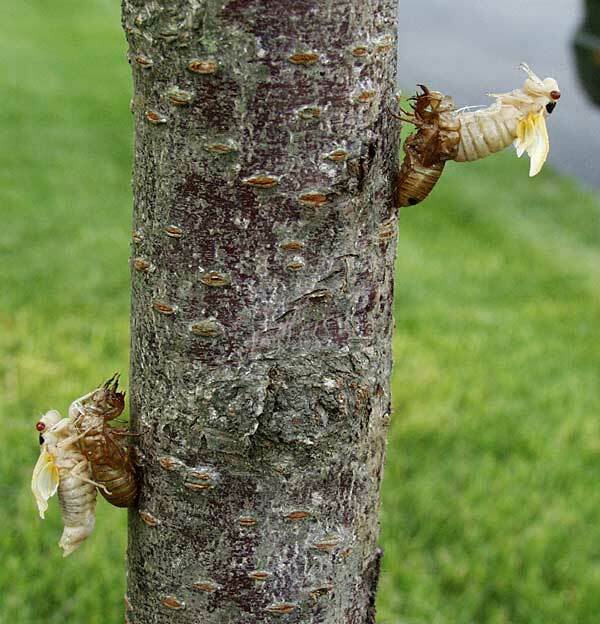 Some broods of 17-year periodical cicadas are on schedule to emerge from the ground much sooner. In the mid-Atlantic states, for instance, Brood II is due in 2013 and Brood V in 2016, judging from their past behavior, according to a website kept by their admirers. Others on 13-year schedules are coming to the South and Midwest in 2014 and 2015. Though hoards of them sneaked up silently from the underworld, and are likely to fly straight at your face, they mean no harm. They are hapless bumblers — so inept that they must reproduce in huge numbers to keep their species going. They just want to get life done: make a summertime racket, mate, lay eggs and die, which they will do before long. Though “stragglers” are known to come too early or late for their broods, most are punctual, spending their 17 years grubbing around underground, then climbing into open air and up the bark of trees. I don’t know what damage they do underground during their long pupal stage, but after coming out of the soil, their worst offense to humanity, besides their noise, is creating an ongoing shower of five-inch twigs, falling from trees where the females inject their eggs for the next generation. Some people from the West have never heard them. Cicadas drone like a Philip Glass chorus of weedwhackers or dental drills, moving gently in and out of phase — laying down a continuo for the slightly more melodious calls of crickets and tree frogs. University of Michigan bug experts caught this audio. Here in D.C., the monotonous summer racket fills the air like the humidity. Only when you walk a few yards down the street do you realize that much of that noise came from a single tree, maybe a single bug. The next tree buzzes separately but just as tirelessly. 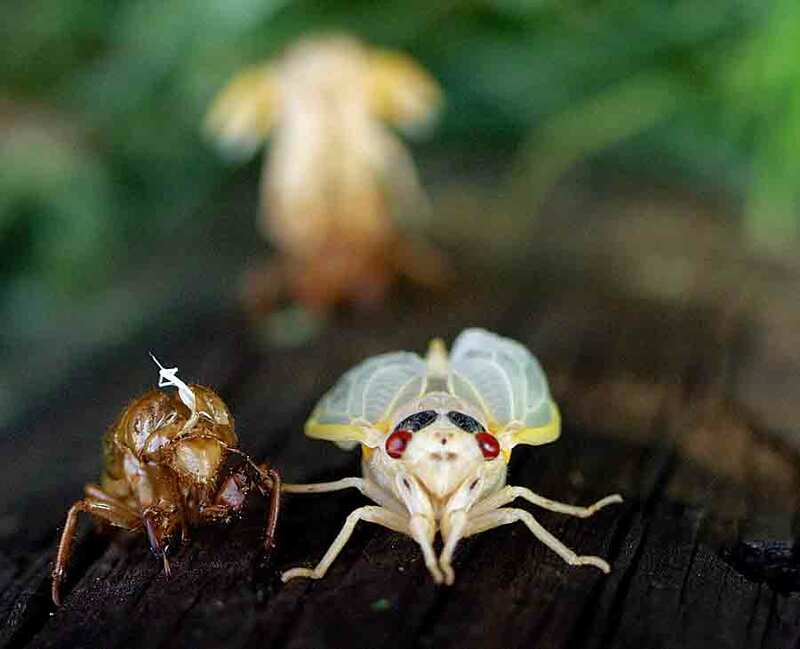 Though adult cicadas are pasty white with wrinkled yellow wings when they first moult out of their shells in summer, they quickly quickly darken as they prepare for courtship, unfold beautifully veined wings and become fatheaded black buzzers with appealing, bulbous red eyes. To get them to hold still for a group portrait, I refrigerated a few of them — supposedly a standard nonlethal sedative — and photographed them with a flatbed scanner. Magicicada septendecim are kind of handsome when they’re not flying into walls.